In the fall of 2014, Portland Bolt was chosen to provide bolts on the US Army Corps of Engineers Middle East District Dahla Dam Improvement Project. Portland Bolt was able to supply over 12,000 pounds of custom A193 Grade B7 and F1554 Grade 55 rods along with custom plate washers in just over two weeks to meet the demanding schedule. We are well versed in international shipments using the proper international pallets that conform to ISPM 15 standards and provide all the necessary paperwork prior to shipping for easy customs clearance. 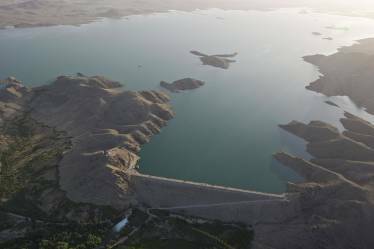 The Dahla Dam is located in the Kandahar province of Afghanistan just north of Kandahar City. On the Arghandab River, the dam provides the irrigation water for the Arghandab Valley where agriculture is the primary industry of the region. The dam was in need of serious repairs to the water control features to reduce water loss due to leakage and upgrade reliability and safety. Since the region relies so heavily on the snow melt from the Hindu Kush Mountains it is critical to retain as much of the spring runoff as possible. Whether you have a project on the East Coast or halfway across the world, Portland Bolt has the capabilities and expertise to get the bolts delivered on time and correctly to any destination worldwide.